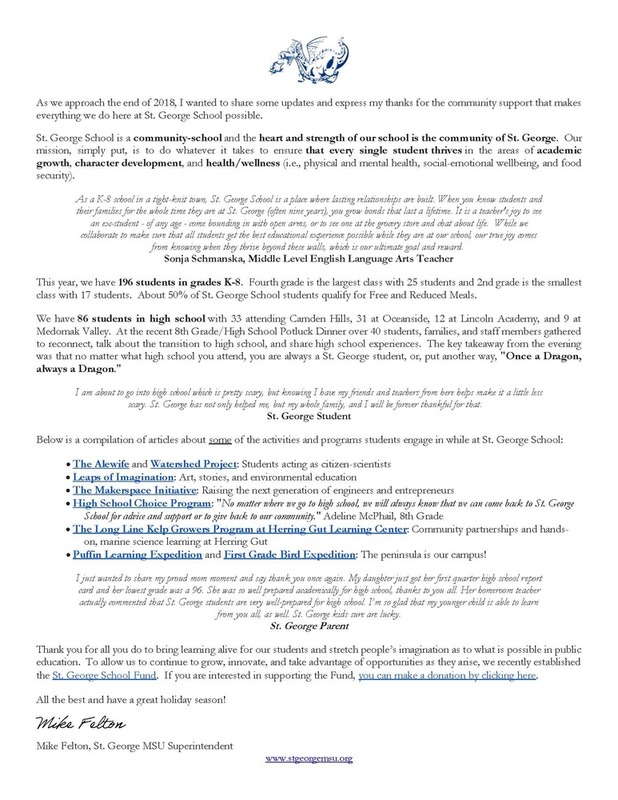 As we approach the end of 2018, I wanted to share some updates and express my thanks for the community support that makes everything we do here at St. George School possible. St. George School is a community-school and the heart and strength of our school is the community of St. George. Our mission, simply put, is to do whatever it takes to ensure that every single student thrives in the areas of academic growth, character development, and health/wellness (i.e., physical and mental health, social-emotional wellbeing, and food security). As a K-8 school in a tight-knit town, St. George School is a place where lasting relationships are built. When you know students and their families for the whole time they are at St. George (often nine years), you grow bonds that last a lifetime. It is a teacher's joy to see an ex-student - of any age - come bounding in with open arms, or to see one at the grocery store and chat about life. While we collaborate to make sure that all students get the best educational experience possible while they are at our school, our true joy comes from knowing when they thrive beyond these walls, which is our ultimate goal and reward. This year, we have 196 students in grades K-8. Fourth grade is the largest class with 25 students and 2nd grade is the smallest class with 17 students. About 50% of St. George School students qualify for Free and Reduced Meals. We have 86 students in high school with 33 attending Camden Hills, 31 at Oceanside, 12 at Lincoln Academy, and 9 at Medomak Valley. At the recent 8th Grade/High School Potluck Dinner over 40 students, families, and staff members gathered to reconnect, talk about the transition to high school, and share high school experiences. The key takeaway from the evening was that no matter what high school you attend, you are always a St. George student, or, put another way, "Once a Dragon, always a Dragon." I am about to go into high school which is pretty scary, but knowing I have my friends and teachers from here helps make it a little less scary. St. George has not only helped me, but my whole family, and I will be forever thankful for that. Puffin Learning Expedition and First Grade Bird Expedition: The peninsula is our campus! I just wanted to share my proud mom moment and say thank you once again. My daughter just got her first quarter high school report card and her lowest grade was a 96. She was so well prepared academically for high school, thanks to you all. Her homeroom teacher actually commented that St. George students are very well-prepared for high school. I’m so glad that my younger child is able to learn from you all, as well. St. George kids sure are lucky. Thank you for all you do to bring learning alive for our students and stretch people’s imagination as to what is possible in public education. To allow us to continue to grow, innovate, and take advantage of opportunities as they arise, we recently established the St. George School Fund. If you are interested in supporting the Fund, you can make a donation by clicking here. All the best and have a great holiday season!